ect, i.e., momentum is driven by either overreaction or underreaction of investors, recent studies point out the riskiness of momentum strategies. ficant 1.84%, i.e., a percentage decrease of almost 85%. fits represents a risk premium for the exposure of the strategy to systematic crash risk." The momentum risk premium is one of the most important alternative risk premia alongside the carry risk premium. However, it appears that it is not always well understood. For example, is it an alpha or a beta exposure? Is it a skewness risk premium or a market anomaly? Does it pursue a performance objective or a hedging objective? What are the differences between time-series and cross-section momentum? What are the main drivers of momentum returns? What does it mean when we say that it is a convex and not a concave strategy? Why is the momentum risk premium a diversifying engine, and not an absolute return strategy? The goal of this paper is to provide specific and relevant answers to all these questions. The answers can already be found in the technical paper "Understanding the Momentum Risk Premium" published recently by Jusselin et al. (2017). However, the underlying mathematics can be daunting to readers. Therefore, this discussion paper presents the key messages and the associated financial insights behind these results. Among the main findings, one result is of the most importance. To trend is to diversify in bad times. In good times, trend-following strategies offer no significant diversification power. Indeed, they are beta strategies. This is not a problem, since investors do not need to be diversified at all times. In particular, they do not need diversification in good times, because they do not want that the positive returns generated by some assets to be cancelled out by negative returns on other assets. This is why diversification may destroy portfolio performance in good times. Investors only need diversification in bad economic times and stressed markets. This diversification asymmetry is essential when investing in beta strategies like alternative risk premia. On the contrary, this diversification asymmetry is irrelevant when investing in absolute return strategies. However, we know that generating performance with alpha strategies is much more difficult than generating performance with beta strategies. Therefore, beta is beautiful, but convex beta is precious and scarce. Among risk premia, momentum is one of the few strategies to offer this diversification asymmetry. This is why investing in momentum is a decision of portfolio construction, and not a search for alpha. Time-series momentum likes zero-correlated assets. This is why time-series momentum makes sense in a multi-asset framework. Cross-section-momentum likes highly correlated assets. This is why cross-section momentum makes sense within a universe of homogenous assets, e.g. a universe of stocks that belong to the same region. Short-term momentum is more risky than long-term momentum. Therefore, the cross-section dispersion of short-term momentum returns is broader than the cross-section dispersion of long-term momentum returns. The Sharpe ratio of long-term momentum is higher than the Sharpe ratio of short-term momentum. The choice of the moving average estimator is more crucial for short-term momentum than for long-term momentum. Too much leverage can be harmful for the strategy, since momentum portfolios are not homothetic transformations with respect to the portfolio's leverage. Trend-following portfolios are not absolute return strategies. In the long-run, trend-following strategies present a low moderate correlation with traditional asset classes. However, it is an illusion due to long-term averaging, since they present either a high positive or a high negative beta. of momentum strategies on a standalone basis does not make sense. It follows that momentum risk premium is key for building an alternative risk premia portfolio. "This study includes cross-sectional stock data from the CRSP/Compustat database from 1970-2014. In total I use 68 published FC, constructed based on accounting and market data. The focus of the analysis lies solely on large and mid cap stocks, to prevent a potential contamination arising from economically unimportant small and micro-cap stocks. Training a deep neural network for stock picking, is at least partly motivated by a recent important contribution to the open source software community. The so called ”Tensorflow” library provides a highly scalable and flexible machine learning framework, allowing an efficient usage of DL networks and is the core implementation of Google’s artificial intelligence (AI), unit which is under active development. Moreover, the US cross-section of returns is a relative data rich environment. In this application, roughly 2.1 million observations provide a fertile ground for these parameter rich networks. On the other hand, it is hard to assess ex-ante if these methods are suitable for predicting stock returns, due to the inherently different statistical character they possess — for example, the signal-to-noise ratio of a stock return process is a tiny fraction compared to the processes typically encountered in computer science. The main contribution of this work lies in the investigation if recent developments in artificial intelligence are of any use predicting cross-sectional stock returns. Applying artificial neural networks (ANN) in finance is not new. Hence, past attempts have to be distinguished. This study can be seen as an extension to earlier attempts of applying ANN to predict stock returns, with the difference of having access to additional regularization techniques, better computational resources and more data. Additionally, it is, to best of my knowledge, the first study which investigates the cross-section and its relation to a rich set of published FC by exploiting a purely data-driven algorithm without any prior assumption on the functional relation between FC and expected return spreads. Precisely, this paper aims at answering the following main three research questions: First, how can one efficiently employ a DFN framework for the purpose of return predictions? Second, do DFN based predictions add additional economic value compared to a parsimonious linear approach utilizing the same information set? Third, which set of FC drive the prediction results and how far do they differ from recent findings in the literature of FC selection. The first question is related to the selection problem of the optimal DFN design for this exercise. I address this question by stating the problem as an outer optimization problem. This computational intensive task is tackled by utilizing a random search algorithm as proposed in Bergstra and Bengio (2012) in combination with a one-dimensional grid search for learning rate tuning. The procedure reveals that many network designs fail to deliver reasonable numerical behavior. Despite a relatively high failure rate, I identify architectures which show promising improvements compared to the linear benchmarks based on a validation data set. ’s, which are consistently higher compared to the parsimonious linear benchmark. In many (but not in all) cases I document significant higher Sharpe Ratios (SR). No specification favors the linear model, irrespectively of which performance measure is considered. However, a naive strategy is sensitive to trading cost adjustments for both approaches. Nonetheless, I show that a simple rebalancing frequency adjustment leads to stark improvements. An explicit rebalancing optimization is not carried out and can be seen as a limitation of this work. Over the sample period, I document that DFN based portfolios perform much weaker during high volatility periods compared to times of calmer markets, a phenomena which is characteristical for momentum based strategies. Controlling for momentum exposure during these times, levels the alpha’s significantly into the positive domain. The answer to the question which FC drive the predictions points unambiguously at price based information, predominantly short-term reversal (providing an explanation for the turnover intensity) and the twelve-months momentum. However, I study the impact purely by looking at prediction changes arising from variation in the input data. As a result, it can not be seen as a perfect measure, but a computational trivial way in gaining model insights at this stage. This paper examines persistence in the cryptocurrency market. Two different longmemory methods (R/S analysis and fractional integration) are used to analyse it in the case of the four main cryptocurrencies (BitCoin, LiteCoin, Ripple, Dash) over the sample period 2013-2017. The findings indicate that this market exhibits persistence (there is a positive correlation between its past and future values), and that its degree changes over time. Such predictability represents evidence of market inefficiency: trend trading strategies can be used to generate abnormal profits in the cryptocurrency market. "One of the key issues yet to be analysed is whether the dynamic behaviour of cryptocurrencies is predictable, which would be inconsistent with the Efficient Market Hypothesis. Long-memory techniques can be applied for this purpose. The present study carries out a more comprehensive analysis by considering four main cryptocurrencies (the most liquid ones: BitCoin, LiteCoin, Ripple, Dash) and applying two different long-memory methods (R/S analysis and fractional integration) over the period 2013-2017 to investigate their stochastic properties. Moreover, it also examines the evolution of persistence over time (by looking at changes in the Hurst exponent). Any predictable patterns could of course be used as a basis for trading strategies aimed at making abnormal profits in the cryptocurrency market. As can be seen, the series do not follow a random walk, and are persistent, which is inconsistent with market efficiency. The most efficient cryptocurrency is Bitcoin, which is the oldest and most commonly used, as well as the most liquid. Degree of persistence varies over the time, and fluctuates around its average. Carry trade returns vary across fixed and floating currency regimes. Over the last century, outsized carry returns occur exclusively in the floating regime, being zero in the fixed regime. The absence of skewness in floating carry returns rules out a skewness-based explanation for this result. Fixed-to-floating regime shifts deliver negative return shocks to the floating carry strategy, even when controlling for volatility risk. This result explains average excess returns to the floating and therefore the unconditional carry trades over the long-run. We rationalize these findings with a model allowing risk compensation in currency markets to depend on regime. "Our empirical analysis exploits a new database of daily bid and offered exchange rates in spot and forward markets spanning the interval 1919-present. The year 1919 marks the dawn of modern currency trading with the emergence of a continuously traded forward market in London. 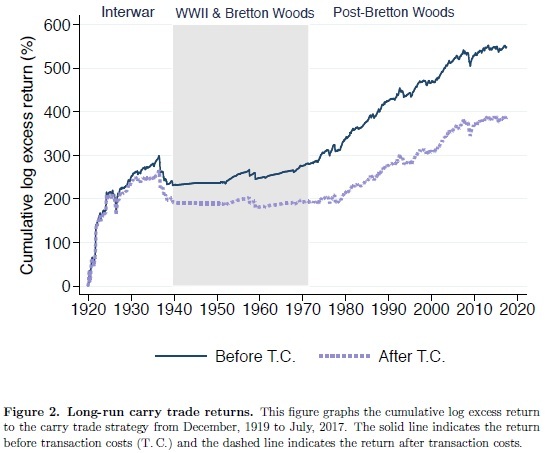 Consistent with the post-Bretton Woods evidence, we find that the carry trade earns significant average returns over the whole sample period. Our estimated Sharpe ratio of between 0.5 and 0.6 is still substantial and only slightly lower than the 0.7 to 0.8 for the post-Bretton Woods sample. This finding of outsized carry returns across the whole period is robust to differing portfolio weights and to the inclusion of transaction costs. We further exploit our data to examine the dependence of carry trade returns on currency regimes by conditioning the return to the carry trade on the exchange rate regime of each currency pair at the beginning of each period.1 We classify any currency pair into a floating (fixed) regime based on whether its exchange rate volatility is above (below) a certain threshold. Our first finding is that carry trade returns vary with exchange rate regimes. Average excess returns of the unconditional carry trade are entirely driven by returns to the carry strategy conditioned on the sample of currency pairs in the floating exchange rate regime. We term this strategy the floating carry trade. In comparison, the carry strategy conditioned on the sample of currency pairs in the fixed exchange rate regime (the fixed carry trade) generates zero returns on average. Moreover, the exchange rate of a floating currency pair tends to move according to a random walk without drift as the average spot return is close to zero and statistically insignificant. In contrast, the exchange rate of a fixed currency pair tends to move as predicted by the uncovered interest parity (UIP). Although the carry component of fixed carry trade returns is substantial at 2-3%, these gains are exactly offset by losses from spot rate depreciation when fixed exchange rate regimes collapse. There are three other results related to our main finding regarding the regime-dependence of carry returns. First, we find that the skewness of returns to the floating and fixed carry trade strategies in our long sample differ from the consensus view regarding skewness in the literature. In the post-Bretton Woods period, outsized carry returns display negative skewness and we confirm this result in our own sample. However, when we examine skewness of floating and fixed carry returns separately in our long sample, only the unprofitable fixed carry trade displays negative return skewness due to losses arising from the collapse of currency pegs. In contrast, the return skewness of the profitable floating carry trade is not significantly different from zero. Second, we further explore the indirect relationship between floating carry returns and the fixed regime. 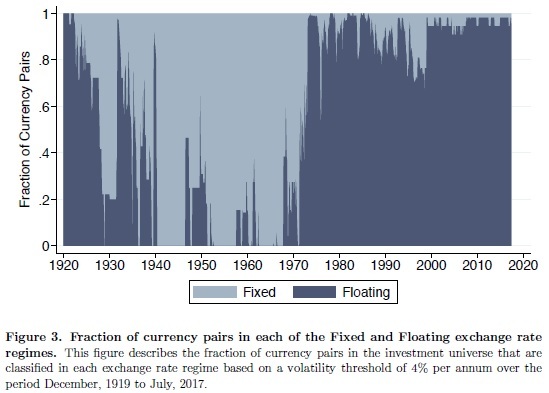 We find that the more that either currency in a floating pair is in a pegged relationship with other currencies, the worse is the performance of the floating carry trade strategy. Last, we ascertain that the variation of carry trade returns is not only related to the time-series but also the cross-section of exchange rate regimes across currency pairs. Our second main finding is that the collapse of currency pegs has spill-over effects on floating currency pairs, thereby causing significant losses to carry traders. The January 2015 abandonment by the Swiss National Bank of its cap on the value of the franc against the euro is an example of such a collapse. The breakdown of this particular fixed exchange rate coincides with poor carry trade returns when investment currencies such as the Australian and New Zealand dollars depreciate against the pound sterling, while funding currencies such as the Japanese yen and Swiss franc appreciate. Our regression analysis verifies that this example is representative of the relationship between fixed-to-floating regime changes and negative returns to the floating carry trade.